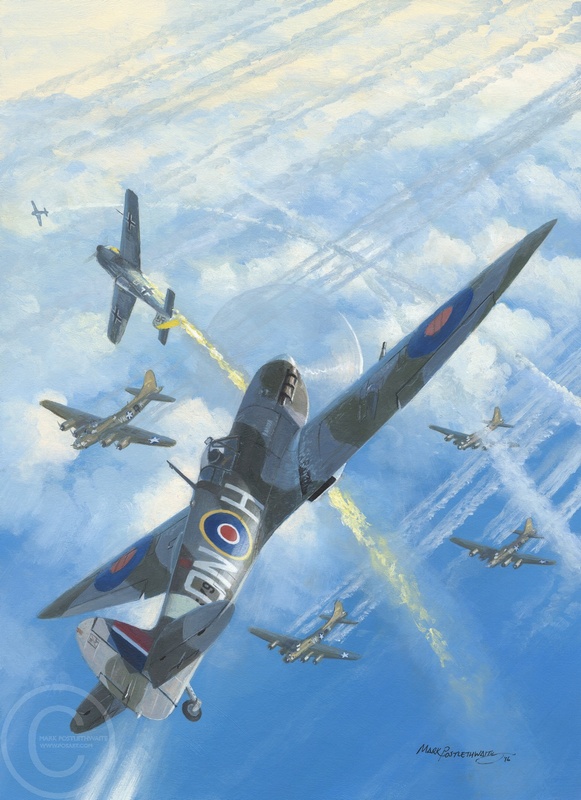 Originally painted for Osprey's Channel Spitfire Aces, It depicts Flt Lt 'Slim' Kilburn, of 124 Squadron flying Spitfire VI BR579/ON-H, shooting down an FW190 of JG26 over the English Channel on 12 December 1942. The specially modified Spitfire VIs were optimised for high-altitude combat, with extended wingtips and pressurized cockpits. On this day, the Spitfires were up covering the return of B-17s of the 303rd BG as they headed home after a raid on Abbeville and Rouen.